If the citizens of Idaho were looking for a change agent in the elections of 2006, they found it in the person of C.L. “Butch” Otter. Elected to be the 32nd governor of Idaho, Otter took office in January of 2007 and embarked on a mission to make his state a safe haven for business. Ten years later, it’s safe to say that site selectors consider this to be a mission accomplished. In the following interview, Otter describes his governing philosophy and how he has made economic development a top priority for his administration from day one on the job. Since you took office as governor, how have you improved the overall business climate in Idaho? OTTER: We have had some pretty good guidance, including from Site Selection Magazine. Necessity is the mother of invention. Right after I took office in 2007, we started seeing some of the economic pullback in 2008. Between then and 2010, we had to change a lot of things out of necessity, so we fashioned an environment that enabled Idaho to come out of the recession before the US did. Here’s how we did it. We chose not to raise taxes. We cut back our expenses. We redefined the proper role of government in Idaho. What did the Constitution tell us we were supposed to do? We did that. We looked at the statutes where we had created law. Were those nice or necessary? We focused on the necessary. We diminished our role in doing the nice things. One example is the subject of the state parks. We said that they were nice but not necessary. I went to the state parks director and told him that we would cut his budget. We reduced funding from the general fund. I told him he needed to find local community partnerships. They drive tourism in the local communities. We found out that there was a lot of community support that had never been called on for our state parks. Boy Scouts and Girl Scouts and other groups volunteered to clean up our state parks. Service clubs volunteered. I was criticized like you would not believe, but this plan proved to be successful. We are proud of our parks in Idaho. We had 30 parks when I started, and we never shut down a single one of them. Another example was our regulatory environment. Many of our laws did not portray us very well to the business community. We asked ourselves whether these regulations were necessary. We combined a lot of agencies. We combined Building Safety under one shop. When unemployment was way up, their department was way down. We moved the Unemployment Department into the same building as Building Safety. We postured ourselves as being friendly toward business. Chobani is a great example. I asked them for their construction schedule. They gave it to me. “I don’t want you waiting on one permit,” I told them. They gave us their permit. They put a million square feet under roof and all the equipment in it to make yogurt in 326 days. When you meet with business executives and talk to them about Idaho, what is your central message concerning your state’s primary value proposition? OTTER: Look at the Chobani deal. There were states that were offering this company some pretty good bucks. They were offering bricks and mortar. Our offer is just infrastructure. We don’t build bricks and mortar. We move at the speed of business in Idaho. An idea at lunch can be public policy at 1:00 p.m. If it’s in our ability to do it and make those kind of changes, then we can do it. We are not going to sit around and wait until 99.99 percent of the facts are in place. We created an environment that people enjoy being in. Capital looks for security and predictability. That resulted in a $550-million investment by Chobani in Idaho. People know that Idaho is going to be firm in its promises and keep its word. 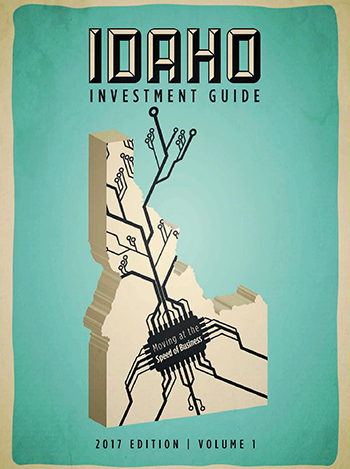 What do you feel is Idaho’s single greatest competitive advantage? OTTER: Our ability to move with public policy as the need requires. We have a Legislature that is very much aware of the key ingredients that go into public policy that will safely and securely produce the kind of economy we want. Our jobless rate went from 9 percent to 3.8 percent from 2007 to today. Companies also need raw materials here like milk and other products grown on Idaho farms. Our farmers outperform those in other states. OTTER: Investing even more into our workforce. We made some huge changes between 2010 and today. I’ve done that in partnership with the state Legislature. I am most proud of the fact that 89 percent of my cabinet all came from the private sector. There is no wait time. If you tell us what you need, we will have the product on the dock when your pickup pulls up. You have to have a workforce that is adaptable. You have to have institutions that can help with that adaptability. I have worked with the community colleges in Idaho on that. The talent demand for plumbers and welders is great right now. The College of Western Idaho is the fastest growing community college in the history of the United States of America. We are trying to do the same thing in Eastern Idaho. As long as we continue to invest in people through education, experience and skill training, we will get them ready to go to work. I was a steel welder. I went back to school for two semesters and learned how to weld aluminum. The community college was there to teach it. What is your state’s best-kept secret that you wish more business leaders knew? OTTER: I live 10 miles from where I was born and I am 74. Idaho offers a family environment, low crime, great access for a rural state, and we are self-sufficient. The living environment is great here. Chief Executive magazine said we were number one in the nation in living environment in 2015. You can be on the ski hill at 8:00 a.m. and go golfing at noon. Other Idaho strengths include our school system, our portals of education K-24, the training of today’s workforce, etc. Every company has to reinvent itself every few years. When I worked in the potato business, we had to change out the equipment where we made french fries. Most of the equipment being used today in these plants is brand new. You have to be able to invent that product that you are going to need in 2018. We have a very creative workforce. What state ranking are you most proud of? OTTER: The fact that we have the number one living environment in America. Also, we are number one in non-farm growth, number one for job satisfaction, number two for tech job growth, and number two for construction growth. Among the Best Cities for Jobs, Boise is No. 8 and Coeur d’Alene is No. 15. And CNBC said that we had the lowest cost of doing business and that we were tops in business friendliness. Part of our portfolio that we have tried to create – in terms of making Idaho a better state for business — came out of Site Selection Magazine. Site consultant Mike Mullis pointed us in that direction. Mike calls it like it is. He tells us exactly what we need to do to win these projects. A guy who is as forthright as he has been with us is very valuable. He said that if we had four 100-acre shovel-ready sites, he could bring the companies. I gave him 64.